Ground controllers are shaking and baking a stuck communications antenna on the Intelsat New Dawn satellite launched last month in hopes the stubborn reflector pops loose in orbit 22,000 miles from Earth. After reaching geosynchronous orbit over the equator, the spacecraft attempted to deploy the west antenna reflector for its C-band communications system. Although the satellite issued the command to deploy the antenna, telemetry indicates the 8.8-foot-wide reflector remains folded in its launch position, according to Intelsat. Orbital Sciences Corp. manufactured the satellite, which is based on the company's Star 2 spacecraft bus. 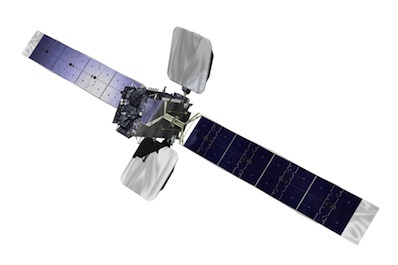 Orbital is overseeing in-orbit testing of the Intelsat New Dawn satellite. "We have not yet been successful in deploying the west antenna reflector, which controls communications in the C-band frequency," said David McGlade, CEO of Intelsat. "Intelsat and Orbital Sciences Corp., the satellite manufacturer, have a sizable team of engineers and experts analyzing the component and the deployment sequence. The team has developed a number of maneuvers to attempt to free the reflector. We are pursuing these actions around the clock, but thus far without the desired result." McGlade said Intelsat New Dawn unfurled its solar panels to generate electricity and is otherwise healthy. Engineers devised plans to softly rock the satellite back and forth in an attempt to free the antenna. The side of the craft with the stuck antenna has also been pointed toward the sun to heat it up in hopes warmer conditions will budget the reflector. "We are pursuing these actions around the clock, but thus far without the desired result," McGlade said Tuesday, noting Orbital Sciences has not experienced such a problem on one of its satellites before. Intelsat New Dawn was built to link Africa, Western Europe, the Middle East and Southwest Asia through Ku-band and C-band transponders and antennas. The satellite is geared for wireless broadband, television and other media applications. Funded by Intelsat and South African investors led by Convergence Partners, the $250 million satellite was supposed to be parked along the equator at 32.8 degrees east longitude for a 15-year design life. Deployment of the spacecraft's east reflector for the Ku-band communications payload was put on hold as officials analyzed the nature of the C-band antenna problem. But McGlade said the Ku-band reflector could be deployed soon. "The Ku-band antenna has some different components also with in-flight heritage," he said. "At this stage, there is no reason to believe that there will be a similar issue with deployment of the Ku-band antenna." Intelsat declined to discuss potential financial impacts stemming from the reflector problem. "We are currently working day and night on trying everything we can to deploy the C-band reflector," McGlade said. "So far, all the attempts have been unsuccessful. But we're not going to give up. We're going to keep trying, and we're going to do that for at least the next week or so. At that point, we're going to then determine whether we should deploy the Ku-band reflector. Once we do that, it will limit the ability to be as aggressive in the thermal and mechanical maneuvers that we've been conducting so far." Michael McDonnell, Intelsat's chief financial officer, said the New Dawn satellite is insured through in-orbit testing for both partial and full loss scenarios. "As it stands today, I'm not going to say I'm positive or negative about this," McGlade said. "We just need to do everything we can and focus on deploying that antenna. If that doesn't work, we're going to do everything we can to serve our customers."